Guess what, my friends? Bath truffles are super easy to make and quick to boot! 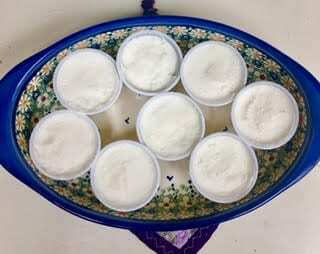 Mix the baking soda and citric acid together, making sure to break up the lumps. You may wish to put them through a sieve to make that easy. Or use your hands and have fun with it! Melt the shea and cocoa butters and drizzle over the dry ingredients. Add the essential oil and mix well. Go ahead, stick your hands in it. It’ll take you way back to your play dough days. Pack firmly into your molds – ice cube trays, silicone molds, little paper or plastic cups, or what you have on hand for molds. Place in the fridge for about 1 – 2 hours to harden and viola! Pop them out and put them in cute little bags, wrap in tissue, or just place one in your friend’s hand and watch a smile spread on their face like the Grinch who finally understood the meaning of Christmas! Consider sprinkling a bit of cocoa powder, dried herbs and flowers, or even Himalayan mineral salt in the molds before packing your truffles into the molds. Makes about 8 two ounce bath truffles. Yay! 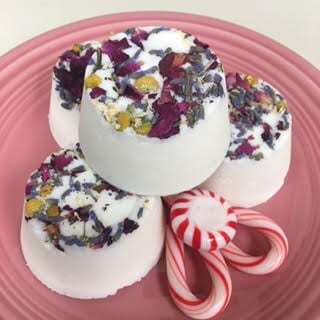 In my bath truffles, I sprinkled dried lavender, rose petals, and chamomile blossoms on the bottom of the molds. My essential oil blend choice was lavender and mandarin orange. 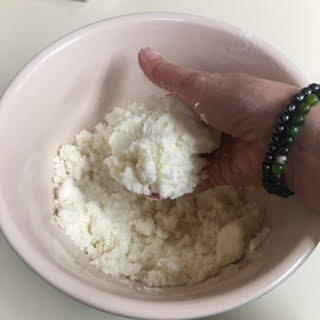 Melt 1/3 cup of cocoa butter, and mix in 1/3 cup baking soda, and a pinch or to to a teaspoon of natural colorant powders such as turmeric, annatto, woad, indigo, alkanet, or rose madder. How much you put in depends on the depth of color desired. Drizzle over the bath truffles after they’re out of the mold for extra skin softening power and cool visual appeal. A word of warning, bath truffles will make your bathtub slippery, so do be careful, my dears. Enjoy and be well! I love you! Since shea butter and cocoa butter are hard at room temperature, is there a risk of plugging the septic system? I’ve had that happen with even trace amounts of cooking oils accumulating, so I’m a bit nervous with hard oils. I’m a little confused. Are you talking about cleaning up the pots, spoons, etc., after making the balm? If so, use paper towels and lots of Dawn dish soap. Rub rub rub with the paper towels and dish soap to get almost all of the oils off before using water and the sink. Then, no worries. If you’re asking about showering after using the balms, unless a person is slathering a whole jar of the balm on themselves then showering, there should be no problem in the shower. I hope this answers your question. If not, help me to understand better what you’re asking. These go in the bathtub, correct? If that’s how they’re used, the coconut oil goes down the drain with the water. They’re so beautiful, but I get concerned with hard oils. Yes, Mary, they go in the bathtub. One bath truffle should not clog up the drain. The tub might be a bit slippery afterward, however.